I have no idea what will. 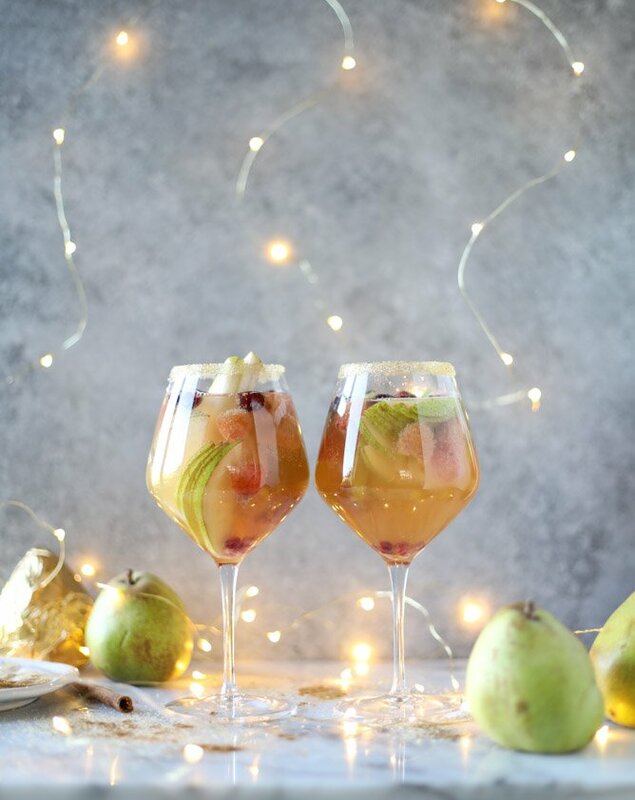 We have here what might be my most favorite sangria to date – and it looks like one giant Christmas ornament! Oh hi, I’ll be drinking nothing but this until January 2nd. Please join in. Look at those boozy layers! Just super stunning, right? 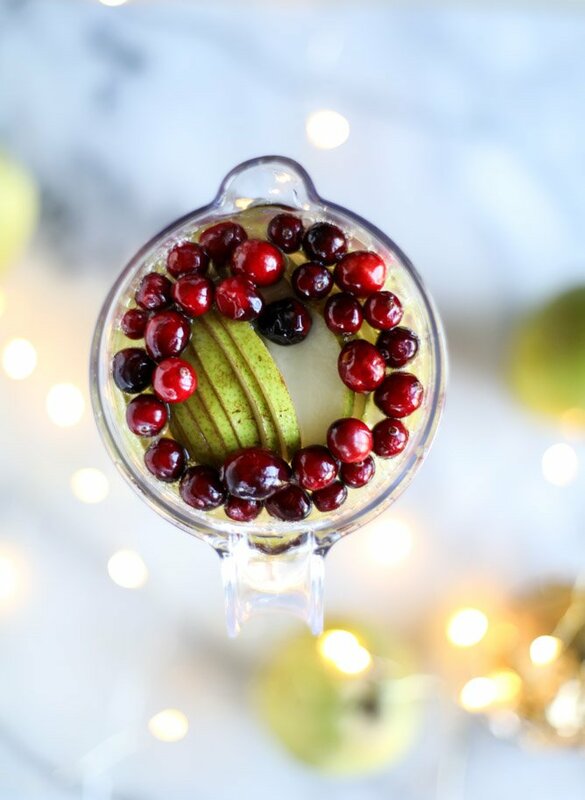 I am 100% convinced you need no other cocktail recipe at your holiday party this year. 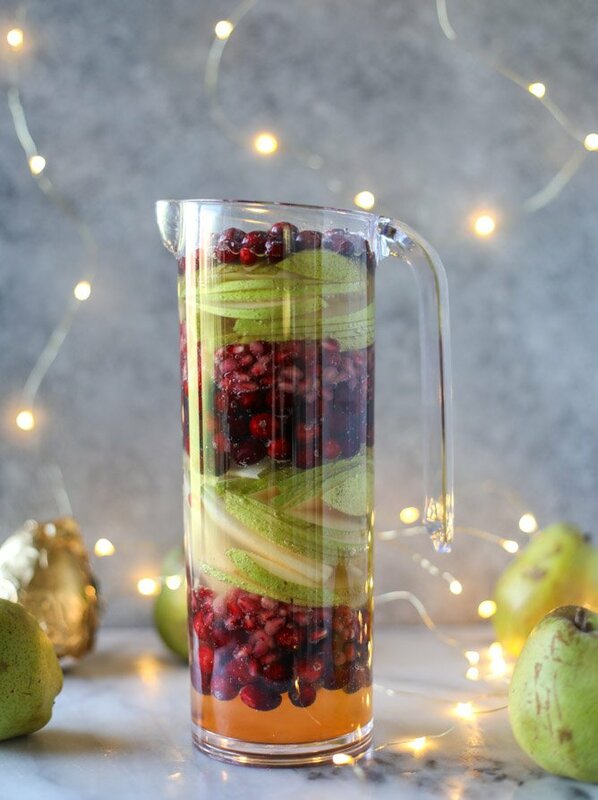 This beautiful pitcher of vibrant love is made with the most delicious Harry and David royal riviera pears. 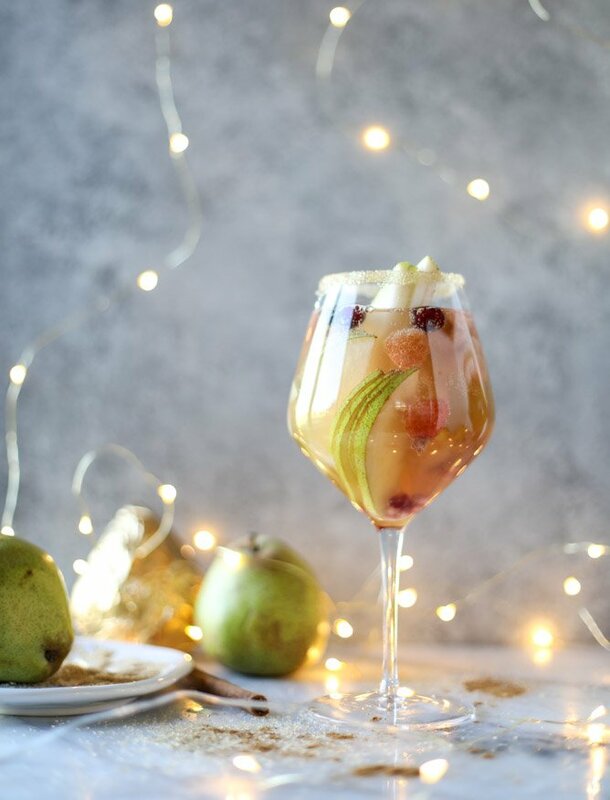 It’s another recipe I’ve created for them this season and there is even better news: it uses some of the pear cider we made last month! 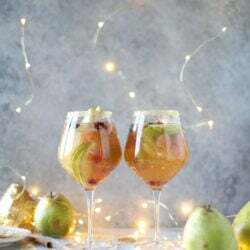 If you don’t have pear cider on hand or have enough pears to make both the cider AND the sangria, you can totally use some pear juice or nectar. 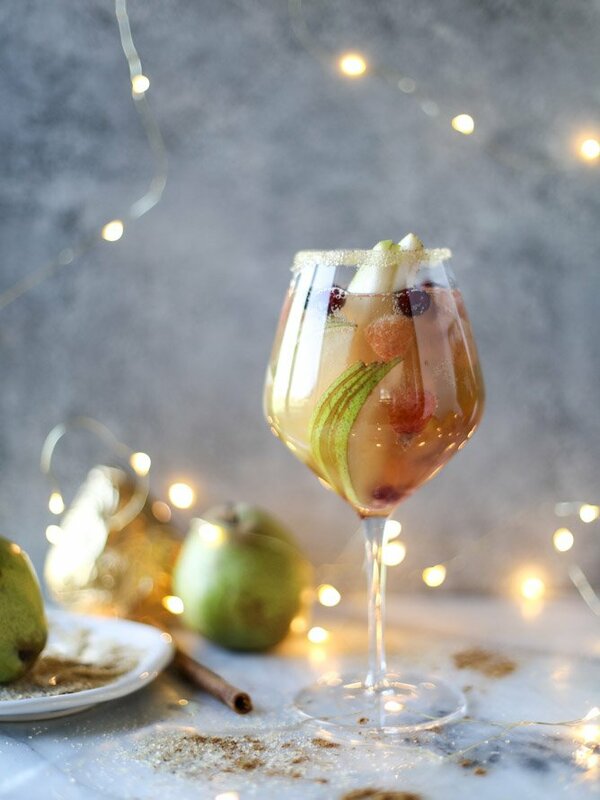 Maybe add in a cinnamon stick or two, because that is exactly what the pear cider adds: some warmth and comforting spice, even in a chilled glass. In addition to the fabulous pear slices, we have cranberries, pomegranate seeds and at the last moment, I threw in a couple golden raspberries that I grabbed at the store the day before. A chilled glass, a cinnamon sugared rim and an endless supply of sangria is exactly how I want to enjoy the new few weeks. I’m actually dreading the end of pear season. I have enjoyed them so, so much this year, from salads to desserts to cocktails and even as a snack. I need nothing else when it comes to a great pear – no almond butter or cinnamon – the pear itself is the perfect bite. And that’s saying something for me. I’m a person who trashes up all meals, including snacks. The new year is definitely going to arrive way too soon. So what if most days until then I’ll be drinking sangria and blasting the N*SYNC Christmas album? 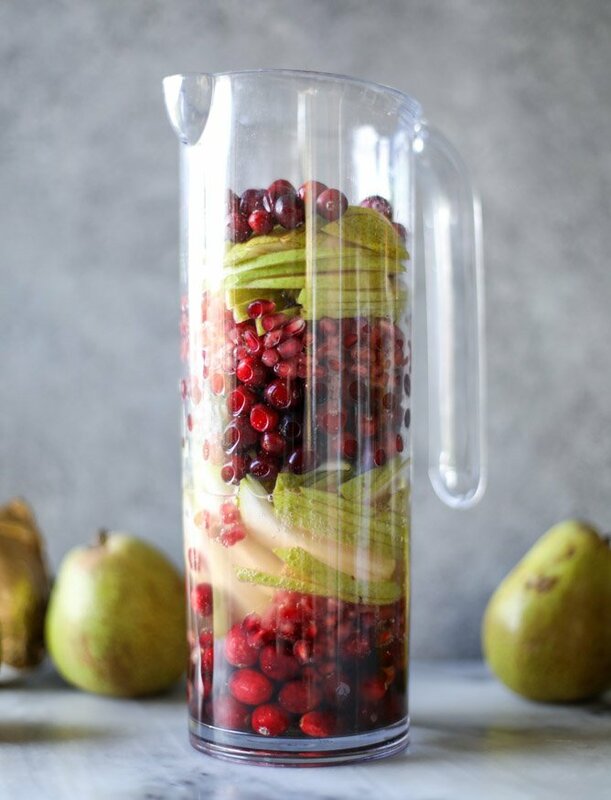 Add the pears, cranberries and pomegranate arils to the bottom of a pitcher. Add all of the ingredients together and stir. Refrigerate for an hour or so (or longer!) before serving. Coat the rim of a chilled wine glass with an orange slice. Stir together the sugars and cinnamon and pour it on to a plate. Coat the rim with the cinnamon sugar, pressing gently to adhere. 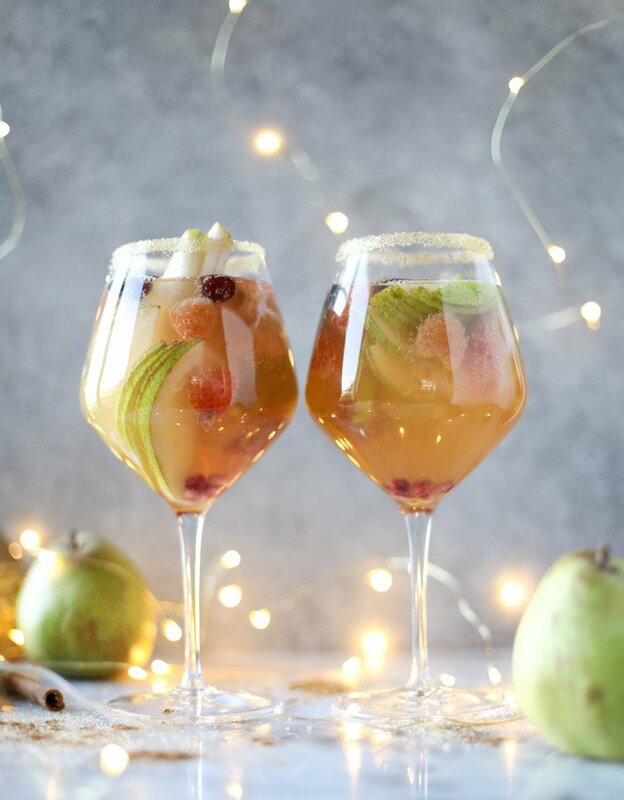 Pour the sangria and serve! Sparkle and shine is how every cocktail should look right now! Now I’m really hoping someone gives us a Harry & David box for Christmas. Best pears ever! 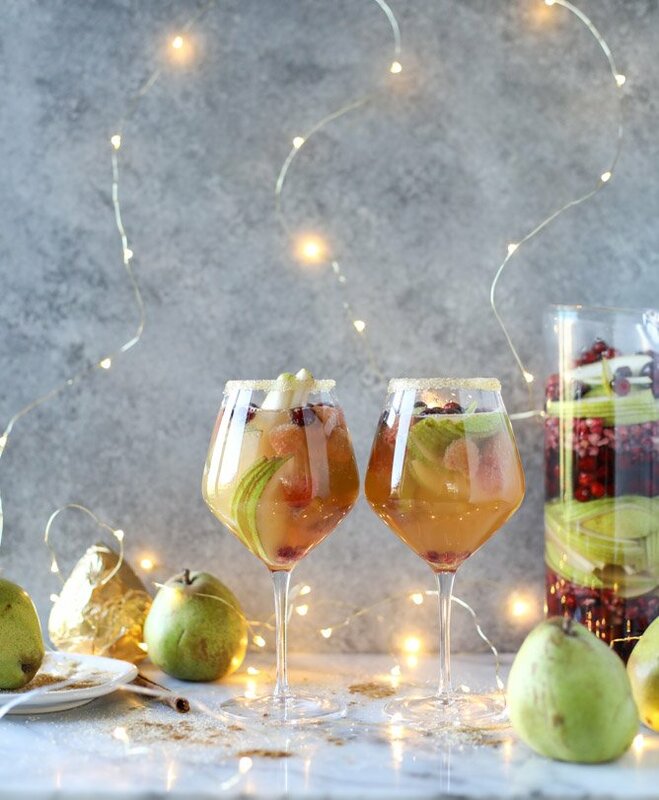 Love the festive colors in that sangria. So pretty. Where are those adorable lights from?! I have the same lights! Look up “fairy lights” on amazon and you’ll find loads of options. This is pretty much my cocktail dream come true!! Pears are totally underrated. These photos are so, so pretty! N*SYNC CHRISTMAS :D :D :D! YASSS! MY GIRL <3 <3 <3! I must try this drink. I love pears and every ingredient! These photos are breathtaking and are also making me thirsty! What a stunning drink! Harry David pears are my favorite. We order them every year! TOTALLY making this for my Christmas brunch. It sounds perfect. Pears are one of my favorite (often overlooked!) fruits. Love the idea of making them front and center. Also, the photos are gorgeous! Love those lights! This sounds amazing! Do you think I could make my own ginger brandy since the stores here don’t carry it? Is it sweetened at all, or just brandy infused with ginger?